Are you looking to buy classic Aston Martin autos? You’ve come to the right place! Aston Martin’s ride to glory has been anything but smooth, with multiple ownership changes during the automobiles long history, occasionally experiencing tough financial times. Founded in 1914 by Lionel Martin and Robert Bamford, Aston Martin began its history at the start of World War I. Interestingly, the full name of the company comes from Martin’s last name and a stretch or road in Herfordshire, England used for racing called the Aston Hill climb. After World War I briefly halted production, Aston Martin continued to produce cars specifically for that racetrack, and focused more on speed than luxury. Competitive racecars proved to be a strain on finances, and Aston Martin changed hands several times until World War II. In 1947 however, tractor manufacturer David Brown purchased the company. Models under Brown’s ownership took on his initials DB and Aston Martin soon achieved worldwide recognition. Models such as the DB2, DB2/4, the DB2/4 MK II, the DB Mark III, DB4, DB5, Db6, DBS, and Lagonda were some of the most popular. Looking to purchase a classic Aston Martin? Perhaps the most recognizable model worldwide was the DB5, which gained instant notoriety when it appeared in the 1964 James Bond film Goldfinger. Outfitted with high-tech gadgets and weaponry, the car was not only a spy fan’s dream, but was cool enough to achieve iconic status instantly. If you are looking to buy 1960’s Aston Martin models, or any from the 1950’s to 1970’s, the team at Beverly Hills Car Club wants to speak with you. Having assisted countless buyers and sellers over the years with all their classic American and European car needs, this team of experts can help you find the right car for your collection. Whether you’re looking to buy vintage Aston Martin models or models with the DB designation, connect with Beverly Hills Car Club to buy classic Aston Martin automobiles today! 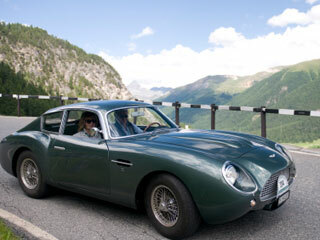 We Also Buy Classic Aston Martin Autos In Any Condition, Top Dollar Paid.